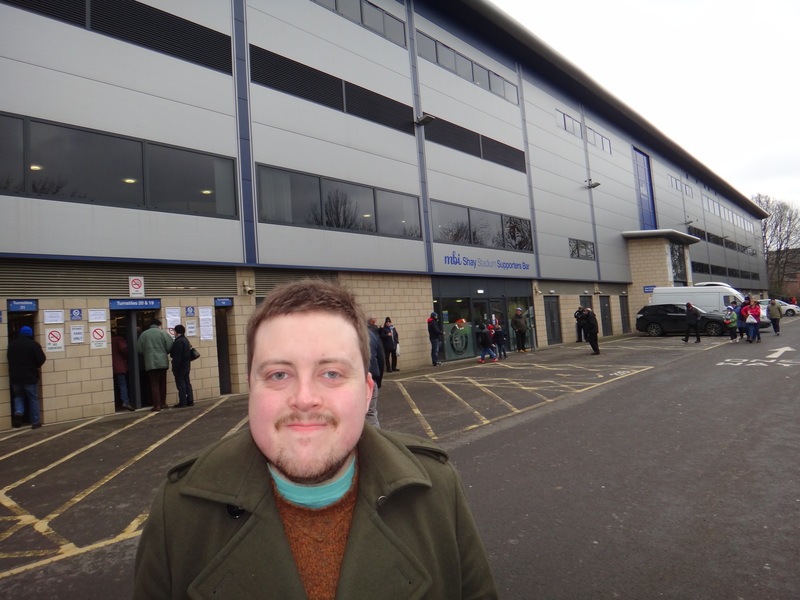 My latest Matchday Adventure saw me venture into West Yorkshire, and to The Shay in particular. There is a curious thing that occasionally happens at the cinema. Every now and then, a scene gets shown in the wrong place. You might see a snippet of some drama not yet ready to be glimpsed by those watching, or else a jarring flashback to something you saw a while back, in this very spot. 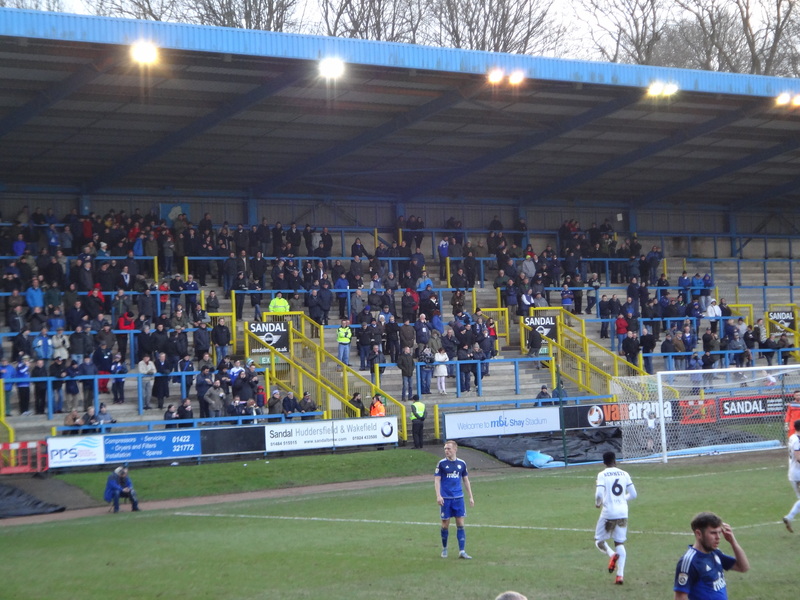 Watched by an increasingly frustrated audience, the latter appears to be taking place at the home of FC Halifax Town. Arriving in the midst of Jim Harvey’s otherwise glorious reign, this is a performance and result which seem to have been clumsily misplaced in the timeline. It has all the hallmarks of Neil Aspin’s latter-day struggles or the Shaymen during the disappointing reign of Darren Kelly. Is this just a blip, or could the fairy tale be over? Over the hills and down in the valley. That’s where you will find the town of Halifax, tucked below the eerie moorlands which sweep across the South Pennines. This has been and remains – to some extent – an industrial powerhouse. The town’s distinctive stone houses are as tough as Jim Harvey’s defence and remain from an era in which Halifax was a leader in producing both textiles and chocolate. 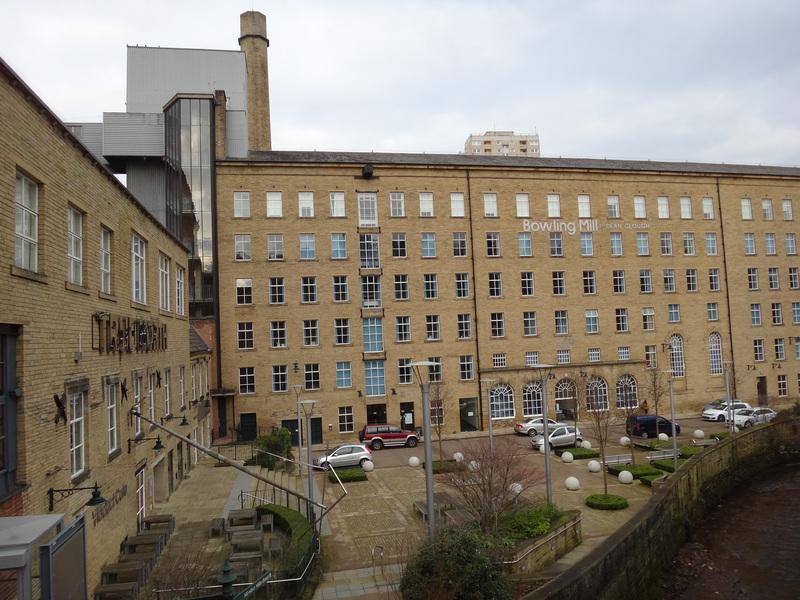 Sadly, though, there’s no record of a merger resulting in a Father Ted-esque ‘Jumper Cake’ being made in this corner of West Yorkshire. Halifax’s historic Dean Clough complex. Regular readers* of the Matchday Adventures column (*if such a thing exists), will know that I enjoy a burger or pie even more than the next groundhopper. But today I’ve treated myself to lunch at Ricci’s Tapas and Cicchetti. There’s Chorizo in Cider. Steak Tartare. Prawns. And before you ask, it does cost less than 90 minutes of Premier League football. I settle down with my groundhopping companion (today: my Dad) and keep an eye out for a possible sighting of Jon Parkin sneaking in for a paella or five. There’s just about time to nip into The 1904 at Dean Clough before kick-off. Despite the grandiose name, it’s a pleasant enough pub just across the street. 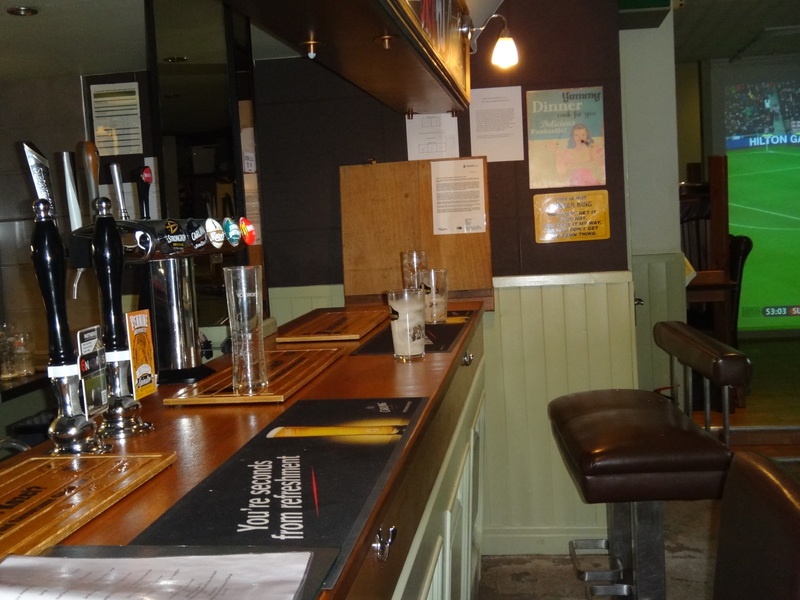 There’s nothing particularly unique about it, but with sport on several screens, good local ales and a friendly feel, it’s a nice place to grab a quick drink and discuss your pre-match predictions en route to the Shay. The likeable 1904 at Dean Clough Pub, in the traditional heart of Halifax. 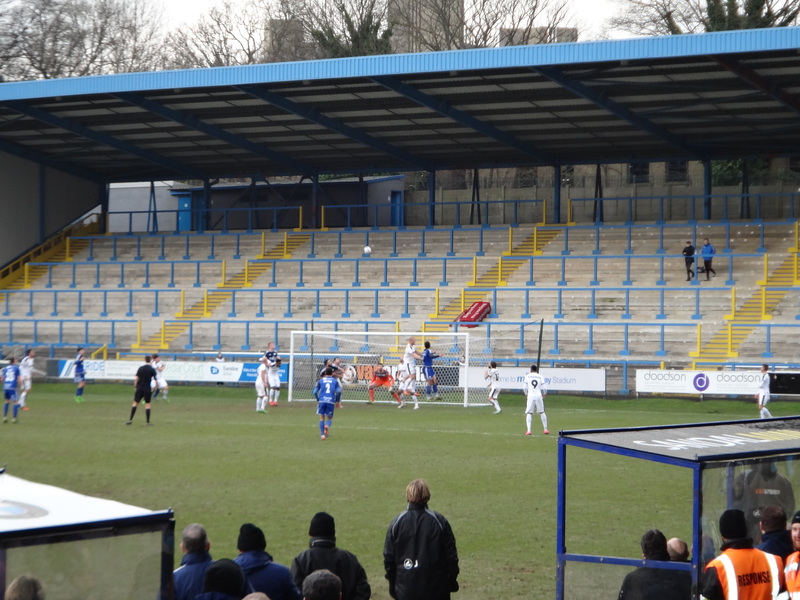 MBi Shay Stadium (known as ‘The Shay’ to literally everyone, everywhere) has spent most of its history hosting league football, and you can tell. The ground has an impressive exterior, two large seated stands running along each side of the pitch and a large terrace behind either goal. The South Stand terrace houses the most vocal home support, and along with the Main Stand, is the only part of the ground which is fairly well populated. As usual, I hassle some poor chap trying to watch the pre-match warm up to ask how they think the hosts’ season is going. Today, it’s Stan, a veteran Halifax Town fan in a debonair flat cap. He asserts that much of the side’s recent improvement is down to the “defence doing well”, but bemoans the deadline day departure of clinical striker Shaun Tuton to League One Barnsley. “The [FA] Trophy would be nice”, Stan admits, “but the league is more important”. It is, he says, “a shame we keep drawing”. A few more wins would certainly help ease the relegation concerns, but overcoming a Forest Green Rovers side challenging for the title is one of Harvey’s toughest assignments yet. A rare snap of yours truly (eagerly awaiting an exciting 90 minutes). The teams enter the fray backed by the unnecessarily dramatic title music from Sky Sports News, and we get underway. The opening exchanges are lively, but neither side can muster an early opener. Elliott Frear fires a rasping shot at ex-Port Vale ‘keeper Sam Johnson, but the tight angle means the Shaymen stopper keeps it out without trouble. At the other end, Scott McManus fires a half-chance waywardly wide for the hosts. It’s Forest Green who gradually tighten their grip on the game, though. The skilful Darren Carter tries his luck with a fierce effort from range, which Johnson spills and is grateful to recover before the FGR frontline has time to react. And the opener arrives shortly after. Halifax are penalised for an alleged handball inside the area from Jordan Burrow, and the imposing frame of Jon Parkin steps up to take the spot-kick. Johnson saves superbly but watches with dismay from the ground as his save lands back at the feet of the experienced Parkin, who gobbles up the rebound. 1-0. Halifax see a few strong penalty claims waved away from referee Ian Hussin (who has an absolute shocker of a game), before their task becomes, in the words of the immortal Paul Merson, “double harder”. A fantastic breakaway run from the pacey Keanu Marsh-Brown is matched by a lovely cross to the unmarked Frear, who fires calmly back across goal, leaving the outstretched Johnson helpless. 2-0. The Rovers side pile onto one another in celebration, in front of a bitterly frustrated South Stand faithful. The Shaymen get one good chance before the half-time whistle goes, and we huddle inside with a cup of tea away from the bracing West Yorkshire afternoon. It falls to Sam Walker, and in fairness, it is a superb strike. But it’s matched by the flailing arms of Rovers #1 Steve Arnold, who palms it clear. And nobody follows in. It’s a moment which perfectly sums up both the home side’s capabilities and the overly-cautious approach they adopt in this opening period. A first-half chance goes begging for the Shaymen. The second half is a quieter affair, though not without flashes of excitement. Substitute Richard Peniket, a former Wales U21 international pings a header over the crossbar following a beautiful cross from an otherwise quiet Kingsley James. If he heads it into the ground, it might be game on again. But the chance goes begging, and Halifax will not get another opportunity like it. Town play some good passing football in the second period but show a real reluctance to take risks and shoot. Even Jordan Burrow, the lively forward who netted his 13th goal of the campaign in the midweek FA Trophy win over Chester, seems frightened to try his luck. And in the closing half hour, it’s the away side – on their rare counter attacks – who look the more likely to add names to the scoresheet. Rob Sinclair hits an exquisite effort which loops just over the bar. Darren Carter goes even closer, firing a rasping shot straight against the frame of the goal. And the speedy Kurtis Guthrie and Keanu Marsh-Brown seem able to run the home defence ragged at will. In the final stages of an increasingly fractious and physical game (thankfully/sadly dampened by the exit of the pantomime villain Jon Parkin), things almost get worse for the hosts. A frustrated South Stand faithful watch on with the game at 0-2. Marsh-Brown has a one-on-one well saved by Johnson, whilst Halifax midfielder Connor Hughes loses his temper and starts scrapping with the opposition defence, and could be considered fortunate to stay on the pitch. The referee and his team of officials are vociferously booed off, and the Halifax players applauded heartily even in defeat. Jim Harvey has a first defeat as Town boss, and against the club he managed for 3 years. It’s bound to hurt. But relegation would be a much tougher pill to swallow. Ticket Prices: Adults (£17), Concessions (£13). This applies to all areas of the ground, and for both home and away supporters. Travel: Halifax is well served by rail. There are regular trains from major Northern stations such as York, Leeds, Huddersfield and Blackpool North. Halifax railway station, located in the centre of the town (0.6 miles walk from MBi Shay Stadium) is also on the London Kings Cross-Bradford Interchange line. By car, head off the M62 motorway onto the A629 at Junction 24, and follow the signs for Halifax. The ground will be on your right, 3 miles further on. Postcode: HX1 2YS. There is parking at the stadium, costing £3. I arrived at 2:30pm and the car park was mostly (though not entirely) full. Otherwise, there are several car parks in the centre of Halifax. Posted on February 14, 2016, in Dave's Matchday Adventures, FC Halifax, Forest Green Rovers, UTL Archive, Vanarama National League and tagged FC Halifax Town, Forest Green Rovers, Groundhopping, MBi Shay Stadium, National League, The Shay. Bookmark the permalink. Leave a comment.